I’ve touted how wonderful the recipes in both my scrumptious avocado salad post and my pan seared tilapia post are, but to combine the two creates nirvana. 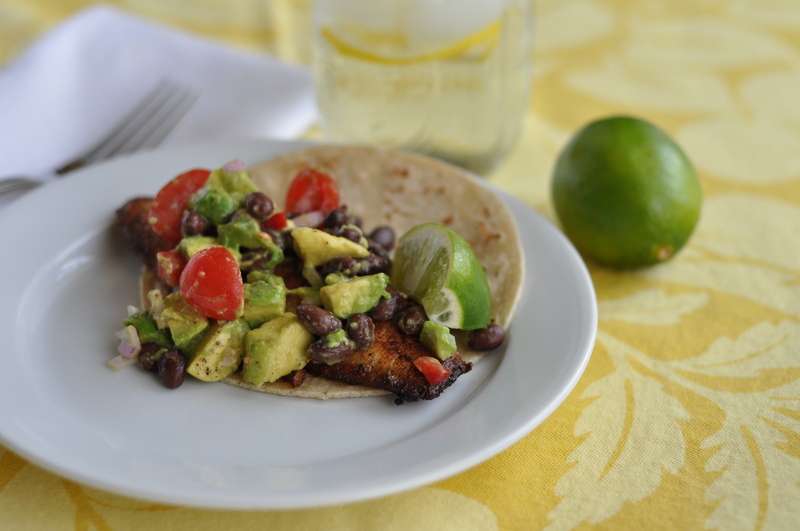 If I was exiled to a deserted island and could only bring one thing to eat, I would bring pan seared tilapia fish tacos with avocado salad and eat them all day every day – they are that good! Assemble taco by laying a pan seared tilapia filet on a fresh warm tortilla and adding a scoop of scrumptious avocado salad on top. Pick up and devour! Enjoy! Not sure I could handle the black beans all day everyday but otherwise, sounds GREAT!!! Ummmm…so I was at an unnamed Mexican establishment last night and had these for dinner. Yummy for sure, but I think this recipe might one-up that of the unnamed establishment.